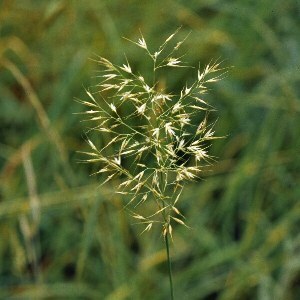 An attractive-looking yellowish perennial grass, with delicate oat-like spikelets and flowers. Found in base-rich or calcareous grassland (but not usually on sand dunes) and mainly associated with the basaltic scarp, old chalk quarries, and Carboniferous limestone regions. Downy oat-grass (Helictotrichon pubescens) overlaps with this species in geography and habitat but is a coarser species with larger, more oat-like spikelets. All names: Trisetum flavescens (L.) P.Beuav. ; Avena flavescens L.